Just after 5:00 every weekday morning, while most of his schoolmates are sleeping, Collin Dillon joins his mother, Monique, at the kitchen table for a hot breakfast. An honor student with a gentle yet sunny disposition, Collin loves manga and drawing, and he hopes to work as a filmmaker someday. His parents are immensely proud of his achievements and ambitions. The Dillons live in a three-story, early 20th century home in the historic, largely working-class, predominantly black neighborhood of Dorchester in south Boston. His father owns an auto repair shop, and his mother is a grant specialist; both grew up in the neighborhood. The nearest public school is just a few blocks away. But every morning, the Dillons put Collin on a bus that takes him 90 minutes or more out of the city to a public elementary school in the coastal community of Marblehead. Collin participates in Metropolitan Council for Educational Opportunity — METCO — the nation’s longest continuously running voluntary school desegregation program. METCO, which just celebrated its 50th year, is implemented in 37 school districts around Boston and Springfield, Massachusetts, and is one of only a handful of such programs nationwide, including one in Hartford, Connecticut, and another in Rhode Island. Urban families must sign up their children to participate, and suburban communities must opt in. Districts that choose to accept METCO students — they decide how many to take — include them in their enrollment figures, which count toward state funding. This school year, they also received an additional $4,065 per METCO student from the state, plus a state transportation grant that varies widely by district — from less than half to over two-thirds of that per-student allocation. METCO has produced some real, measurable successes. But its impact is limited in scope, and participating families face significant burdens, such as rising very early each morning and sacrificing some connection to their local community. At a time when voices across the political spectrum are engaged in passionate debate about how to remedy inequity in America’s schools, METCO is a study in the complex challenges of meeting those goals. Collin’s daily 22-mile journey up the Massachusetts coastline in search of a better education yields insight into the initiatives and programs intended to remedy the inequality in education that has become one of the most pressing civil rights issues of our time. Racial segregation in housing and education has long been an aspect of life in Boston. Even today, Boston ranks in the top 20th percentile of most-segregated cities in the U.S. The racial divisions correspond closely to economic ones, and the resulting inequality is perhaps nowhere as stark as in the area’s public school systems. While schools in affluent suburbs such as Wellesley and Dover are considered some of the best in the country, those in neighborhoods with large concentrations of people of color, such as Mattapan and Dorchester, rank lower by most measures. Boston’s busing program lasted 14 years, prompting thousands of white families to move to the suburbs. Meanwhile, all this time, the METCO program had been operating with little fanfare or controversy. METCO was founded in 1966, the year Martin Luther King was pelted with stones in Chicago while delivering a speech about nonviolent protest. Against a national backdrop of racial conflict, a group of African-American parents came together to seek a remedy for inequality in Boston’s predominantly black public schools. METCO was the fruit of their work, founded in collaboration with city authorities. At the program’s start, only seven suburban communities signed on — a number that has grown to more than three dozen. The Dillons are second-generation participants. Monique’s mother, who also grew up in Dorchester, has vivid memories of her own childhood in Boston’s public schools, where African-American students were singled out for discrimination, violence, and “the soft bigotry of low expectations,” she says. She signed her children up for METCO in the early 1970s, and every morning, Monique and her sister boarded a bus to Concord — which still has one of the top-ranking school systems in the country. Tianna King, a Boston resident who sends her children to public schools in Dover through METCO, also believes the sacrifices are well worth it. As Collin boards the bus at 6:12 a.m., several dozen children are already chatting happily in their seats. This year, Marblehead accepted 81 METCO students. According to 2016–17 enrollment statistics, the town’s public schools are 86 percent white. Participation in METCO is race-blind, but, like Collin and his friends on the bus, the overwhelming majority of METCO students are children of color. For the school year ending in June 2017, 34 percent of METCO students qualified as economically disadvantaged under Massachusetts state law, while just 8 percent of students in receiving districts fell into that category. Collin chats gamely with his friends as the bus makes a half-dozen stops in different Boston neighborhoods. But by the time the driver steers the vehicle out of the city, Collin’s eyes are drooping. Before long, he is fast asleep. When the bus pulls up in front of the Village School, a two-story, brick K-6 elementary school with a bright interior several minutes from the town’s historic center, he jolts awake and calmly disembarks with the other kids. “Did you do the math homework?” he asks a fellow fifth-grader who is stepping out of his mother’s Prius. Comparing notes, the two boys enter the school together. There is little doubt the METCO program benefits participants. Studies indicate that they consistently graduate from high school at far greater rates than students in their home communities in Boston and Springfield — even those across the state. They outperform Boston Public School students on standardized tests: METCO students achieved proficient or advanced marks on the state’s standardized English Language Arts test at a rate of over 95 percent, compared with 82 percent for Boston students as a whole, and bested their peers by a similar margin in math. According to METCO surveys, over 90 percent of program graduates go on to attend two- or four-year colleges, and nearly 50 percent of the four-year college graduates obtain advanced degrees. High-profile METCO alumni include Boston City Councilor Tito Jackson and Baltimore State’s Attorney Marilyn Mosby. The benefits of programs such as METCO go well beyond raised test scores, and they accrue not just to the students in the program but to their host communities as well. METCO helps teach public school students about civic engagement and, above all, how to get along with others, including children from different backgrounds. Still, METCO has limitations, the most obvious being size. Because schools must opt in, the program is necessarily constrained: At present, approximately 3,500 students — out of a student population of 56,000 in Boston and another 26,000 in Springfield — participate. The costs and logistics of busing students from one community to another, far away, present another challenge. But long commutes are just the start. METCO requires extraordinary commitment from students and their families. Urban kids coming into a suburban district may have to work hard to ramp up to more advanced curricula. Assimilating into a community that looks very different than their own neighborhoods, which are majority black and Latino, can be challenging. It’s not always easy to bring down the barriers. Then there’s the challenge of parent or guardian involvement. Teacher conferences, for instance, are burdensome for parents who work in Boston and have to replicate their children’s commute in the middle of the day. Earlier mornings mean earlier bedtimes for everyone, and parents may miss out on opportunities for social and leisure activities in the evenings. Then, in 2007, the Supreme Court ruled in Community Schools v. Seattle School District No. 1 that public school systems cannot promote integration through measures that take account of students’ racial identity — changing the legal landscape for initiatives like METCO. 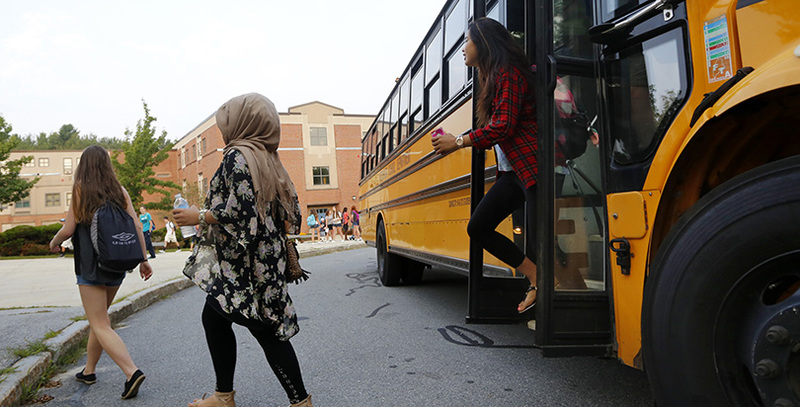 Even so, expanding METCO’s model — even in Boston — poses significant challenges. First, there are problems of scale and impact. It’s up to the host districts to make space available, and there is little indication that they have an appetite for more. The demand for METCO spaces, not surprisingly, far exceeds the supply. According to Jean McGuire, who stepped aside as METCO’s director this past year, at age 86, there are more than 10,000 children on waiting lists. Getting in requires planning far, far ahead: A quarter of METCO parents, says McGuire, signed up for the program before their children were a year old. Second, notes Richard Rothstein, a research associate at the Economic Policy Institute and a fellow of the NAACP Legal Defense Fund, programs like METCO are limited by geography. A third, more uncomfortable, problem is that METCO may have a negative effect on the neighborhoods its children leave behind. In fact, as the education landscape has changed, introducing a variety of reform initiatives, some charter school advocates question how relevant METCO continues to be. There are also financial strains that participation in METCO inflicts on host districts. Though METCO was designed to be cost-neutral, the additional expenses associated with educating METCO students far exceed the $4,065 per student allocated by the state; barring local grants, gifts, or other funding sources, host districts have been making up the difference out of their own taxpayer funds. For example, an independent 2016 study of Lexington Public Schools, which accepts approximately 250 METCO students, concluded that the program cost local taxpayers $4.2 million for operating expenses. Chuang notes that the state line item that supports METCO, totaling about $20 million per year, has remained relatively unchanged for much of the past decade while serving about the same number of students. “This means that over time the state funding covers less and less of a cost of educating those students. The amount of funding has held steady over the past decade, but costs of educating those students have increased,” he says. In addition, though the program was set up under the concept that seats would be offered on a space-available basis, with the passage of decades it has become clear that in many communities, METCO students are not merely filling empty seats. The number of METCO students is often simply added to district enrollment figures and projections, which in some towns feeds a burgeoning student population that they then need space to accommodate. In Lexington, the 2016 study estimated that participation in METCO cost taxpayers $1.4 million in capital expenses. The town of Brookline, which currently accepts more than 300 METCO students, is exploring the creation of an additional elementary school to accommodate a sharp spike in student enrollment over the past decade, at a preliminary projected cost of over $100 million. Although METCO receives widespread local support and most town officials express a commitment for continued participation, some local voices raise concerns. A 2014 report focusing on school population by economist Lee Selwyn, a member of a subcommittee of a budget override study, pointed out that the School Committee budgeted “for nonresident students before assessing the space available in the district” and alleged that “the decision of the School Department not to adhere to and enforce its own ‘space available policy’ ” had “contributed directly and inextricably to the nearly 1,100-student jump” in enrollment since 2006. A 2011 Pioneer Institute white paper titled METCO Merits More: The History and Status of METCO, written in collaboration with the Houston Institute for Race and Justice at Harvard Law School, recommended that Massachusetts and education leaders offer more incentives for suburban districts to sign on. “The state should find new ways to support school districts participating in METCO program, possibly by tying building reimbursements to participation and offering competitive grants for teacher training or innovative programs,” the paper said. Still, any expansion of the program, or even organized opposition to the program as it currently exists, could make the expense noticeable and difficult to sustain. It might also start to invite legal challenges and attacks from conservative groups that, as Eaton points out, oppose affirmative action and other race-based equal-opportunity policies. “Under such challenges, often backed by prosperous conservative groups, plaintiffs argue that race-conscious programs are discriminatory,” she says. School choice is not the same thing as excellence in schooling. Though some of Boston’s public charters have good track records, the data remain inconsistent. According to Rothstein, widely touted ed reform solutions to racial inequality are no substitute for desegregating urban neighborhoods. By 4:30 p.m., as the sun is lowering in the sky, the METCO bus threads its way along the smaller roads that line the ocean and heads back toward the city. The ride is too bumpy for reading or homework, but the atmosphere is lively and happy. Still, an air of fatigue hangs gently over the children’s conversation. The bus passes through the old fishing communities of Swampscott and Lynn. Collin looks out the window at the moving landscape of boat-filled inlets with gulls flying overhead. “I like looking at the houses out here,” says Collin, pointing out his favorite, a solidly built colonial structure. Collin says he loves boating. Sometimes he gets out on the water with his dad. “One time there was a storm; these roads were flooded, and a huge wave crashed near the bus,” Collin says. “Some kids were scared — but the bus driver wasn’t worried, so I wasn’t too worried either.” Collin smiles. As he looks out at the boats in the harbor and the ocean beyond, his eyelids start to droop, and soon he’s napping again, his head resting against the window. It’s a strange thing, this journey across an old and sprawling metropolis in search of a decent education. For Collin, it may be the best of existing alternatives, but as he naps on the bus, it is clear that that it comes at a price.